A user’s first impression of your product sets the tone of your entire relationship. It’s simple: if a user doesn’t see value in your product then they have no reason to become your customer. Onboarding is a change in thinking from how can we get users to convert to how can we serve our users better? 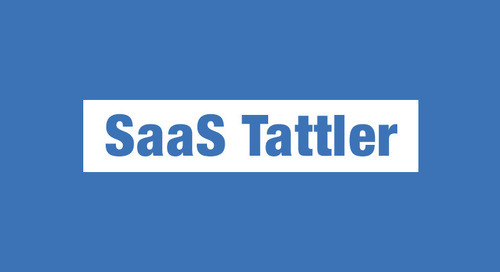 In this issue of the SaaS Tattler we talk about the nature of Onboarding and the impact it has on your growth. Congratulations, people are signing up for your free trial! Step 1 is complete but there is still work to be done. Now we need to show your users the value of your product by building engaging experiences. The trial period is a crucial moment to convert your users into paying customers. In this article, Emma O’Neil provides 5 strategies to improve your company's onboarding process. Asking a new user to commit to paying you straight away is going to scare them off. They probably know very little about your product and are uncertain about the value it can provide them. So don’t make them commit immediately. Instead try the “Foot in the Door” Technique. This marketing tactic recommends you initially ask your customer for something small. Once they have given it to you, ask for something bigger. Then ask for something even bigger. It works by building a relationship and establishing a connection first with users so that when it comes time to commit, they’re already hooked. A successful example of this in action comes from Dropbox. They don’t jump on users to pay for storage space immediately after signing up. Instead, they wait. Initially, new users are asked to sign up for an account and install the product. It’s a small, non-committal ask. After the user does this and has used the initial free space allotted, there’s a bigger ask: get more free space by referring a friend. It’s an in-between step that cleverly engages users further while also spreading the word. Then finally the big ask: if you want more space, become a paying customer. It’s a few simple steps that allow users to become acquainted with the business, see the value it brings and naturally want to pay for the service. Onboarding isn’t marketing. Onboarding is a change in thinking from how can we get users to convert to how can we serve our users better? The question every onboarding team has asked themselves is How can we make their trial so good that becoming our customer is the obvious choice? In this article, Alex Turnbull shares his lessons learned from rebuilding the onboarding process at Groove. 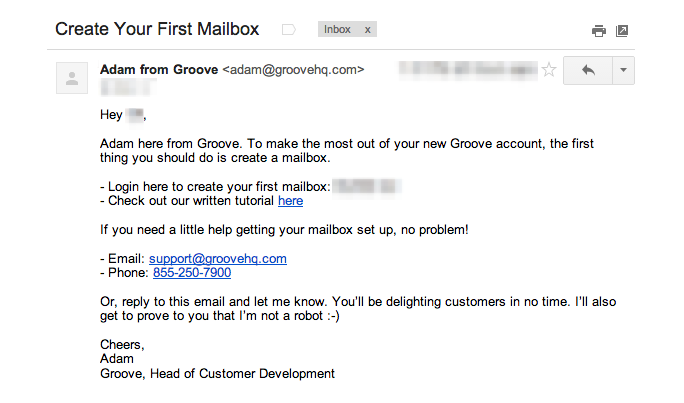 In the past, if you had asked me why we send onboarding emails to our trial users, I would have said, without missing a beat, "to get them to use Groove." Useless product tidbits that had little to do with what the user actually wanted. Our metrics showed it, too: average open rates hovered around 28% for the first email. Great for marketing to prospects, terrible for a someone who signed up for your product within the last five minutes. The painstaking process of redesigning our site with a focus on what thecustomer wants -- and not what we want them to do -- was absolutely transformative. It changed the way we thought about our business. And it was time to apply those changes to our onboarding emails, too. As you implement new onboarding tactics and convert more trials into customers, your company will grow and eventually you will need to hire more employees. Getting new hires up to speed takes time and money but what you really need is for new hires to be productive. That’s where an onboarding process for new hires comes in. In this article, Peter Vanden Bos teaches you how to build an onboarding plan for your new hires. The prospect of the first day on the job is nerve-wracking. New hires are eager to impress their new bosses. So, if they don't know where the photocopier is or how to use it, chances are they aren't going to ask, and will waste time trying to figure the little things out for themselves. And if you throw a bunch of information at them, chances are they're not going to remember most of it. With an effective onboarding program, you should aim to present basic information in an easy-to-digest fashion, so that a rookie can turn to the more demanding aspects of his or her job. The way to do that is to consider the small, logistical details that add up to a sense of comfort and familiarity one has in a workplace. This is good not just for a new hire's peace of mind, but also for the overall health and well-being of your business. 'If a person is new and doesn't know how to use the phone system and accidentally hangs up on a potential client, that client is not going to care that they were new,' says John Sullivan. 'They're just going to be angry. You may not know this but as an early company, your biggest loss is the opportunity cost from missed sales. The people you haven't hired yet are losing you revenue! Your best weapon against this are new hires with the right mentality and the right resources to close a deal. In this article by First Round, they discuss how your company can develop a rigorous onboarding process to build a talented sales team. Onboarding starts before a hire's first day on the job. When people are headed into a new role, they have energy and enthusiasm around your organization. Channel that into learning. You can assign a significant amount of reading at this juncture. What do they need to know to hit the ground running? Bake it into the homework. 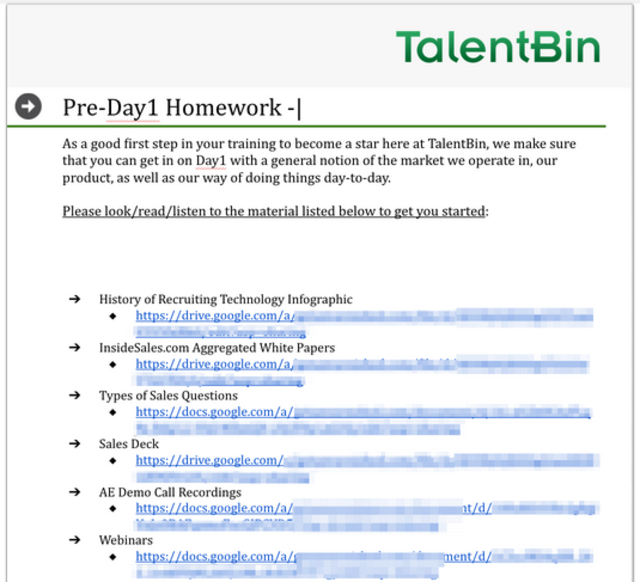 An example of pre-work TalentBin would provide to new hires. Does customer experience (CX) really matter to business success—or is CX just the latest flavor of the month? In this article Harley Manning answers the question, Can Better Customer Experience Improve Your Bottom Line? At its core, marketing is about persuasion. As a marketer, you’re always looking to influence prospective and current customers to act in ways that benefit your brand. Here are 6 Ways to Get Your Customers’ Subconscious On Your Side. Benjamin Brandall takes a deeper look into Why is Customer Success Important? A Guide for SaaS Companies.